We have added another two new fund factsheet templates to our template collection. There are currently 18 different templates available in Topsheets. Every ready-made tearsheet template is well-designed and offers an unique and elegant look. 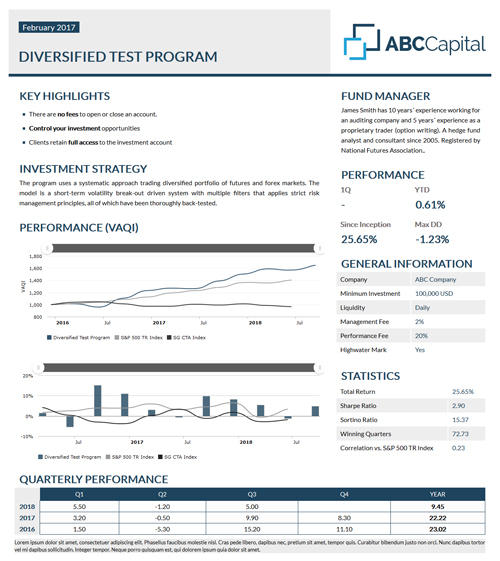 This is a brand new factsheet template with a fresh design that highlights fund´s performance. It is well-arranged as all of its sections are clearly separated but still good-looking. This template offers exactly the same layout and design as one of our time-proven classics – Alpha Plus. However, this one is based on quarterly performance. As with all of our ready-made fund factsheet templates you can change templates´s main color and font settings. This way you can easily adjust your factsheet design to suit your needs. If you would like to customize your template´s content, feel free to take advantage of the edit and settings icons which are present in the top right corner of each section in the report preview frame.